From the video. Click to see larger. Once posted on Facebook, the video instantly went viral, getting nearly 12 million views in the first 48 hours, not counting countless copies others re-posted. The video purports to show a Dover, Del., police officer, Master Cpl. Jeff Davis, in a dashcam video that the department happened to catch “while reviewing in-car cameras,” as it notes at the start. Davis lip-synchs and dances in his seat to Taylor Swift on the radio in a rousing edition of “Shake It Off” (“I keep cruising / Can’t stop, won’t stop moving / It’s like I got this music / In my mind, saying it’s gonna be alright / Cause the players gonna play, play, play / And the haters gonna hate, hate, hate / Baby I’m just gonna shake, shake, shake / Shake it off!”) But it was all staged: Davis, shown waving at other motorists as he patrols, is really in a “secluded parking lot.” The video was recorded in two takes over 15 minutes, hitting the lyrics right on, thanks to Davis having a 10-year-old daughter who likes Swift. “When you drive around in a car all the time listening to Taylor Swift,” the 19-year veteran officer said, “you get to know all the words and like her songs.” Dover Cpl. Mark Hoffman suggested the video, and the specific song, and Davis was happy to play along. “We’re trying to humanize police officers,” Hoffman explained. “People tend to look at us as robots with uniforms and gun belts so we wanted to a show a lighter side of our force.” (RC/CNN) …Sadly, we’re already familiar with faked video evidence. What else you got? Just about every write-up of the video I’ve seen, whether on linkbait web sites or news sites, talks about how Officer Davis was “caught” singing along with the teen idol: they all took it hook, line, and sinker. Yet few have realized the obvious: that police car dashcams look forward, not at the cop behind the wheel! The only way this event could have been seen is if the officer turned his camera around, so it’s obvious that this was staged. Even if that detail doesn’t occur to the viewer, journalists falling all over this story still should still have been suspicious as they watched the video: I noticed the cop kept waving at other motorists …who then couldn’t be seen in the background as he drove on. So I dug in and found that Dover PD admitted it was all a setup, so that’s how I reported on it, once I found a mainstream source that got more detailed in their reporting than the rest — good for you, CNN! But it’s fun! people say. So what’s the real issue here? That Dover PD thinks that faking it and lying is a great way to regain the public trust! Aw, Shake It Off, Randy! Daniel Flannery, 46, a police officer in Cleveland, Ohio, not only got drunk off duty, he got into a fight at The Frosty Beaver Saloon, and allegedly threatened to kill two men. Not only that, but he lost his department-issued firearm and his badge in the process. And then, he kept the facts from the department for days, until the story finally came out. Flannery was fired, but appealed the dismissal — on the grounds that other officers did even worse things, and they didn’t get fired. “The officers cited in the other cases have committed assaults, domestic violence, theft, felony offenses, untruthfulness, and other violent crimes, and have been allowed to keep their jobs with the city,” whined a representative of the Cleveland Police Patrolman’s Association — on the record in arbitration hearings. It happens that the U.S. Department of Justice had been investigating the department. Six days after its “highly critical” report was released, noting that Cleveland’s police officers are often not held accountable for unprofessional actions, a federal arbitrator agreed with the police union, and ordered Flannery reinstated. (RC/Cleveland Plain Dealer) …The arbitrator chose the wrong corrective action. So while the federal arbitrator is perpetuating the problem found by the federal investigation, the city is trying to do the right thing and hold officers accountable. A detail that I didn’t include in the story, because it was already getting far too long, is this quote: “This is just one of many cases where the right actions by the city were taken to terminate or discipline [an officer] and the courts/arbitrators have overturned the decision,” said Cleveland city spokesman Dan Williams. The city is trying to rein in the bad cops, but they’re being thwarted. Maybe they did let too many bad cops slide — and if they did, they have to let more bad cops slide?! A federally mandated case of two (or twenty) wrongs making a right. But it’s not right; far from it. Flannery, the cop in this story, even “admitted to carrying his … gun into the bar, drinking at least three drinks, [and] losing his gun,” but did deny the fistfight. So someone is lying: a drunk cop? Or multiple witnesses? I know where my bet would be. And he did all of this despite having gone through an Alcoholics Anonymous program. Obviously, it didn’t take. The city should not only have the right, but I think has the duty to protect the public from a cop who has proven he can’t get it together. Surely there’s a different job he can do, rather than one where he carries a government-issued means to kill, and may have to make intelligent split-second decisions whether to use that tool. By losing that tool, and then hiding the fact from his supervisors, he has proved he’s not cutting it, yet the city is prohibited from cutting this huge liability loose. Outrageous — and also hugely damaging to the police profession. The way to fix the problem isn’t by faking that a cop was “caught” being human, but to letting them simply be human — and either celebrating that, or ending their careers when they can’t keep hold of their tempers, badges, and guns. Is that really too much to ask? And I say this as a former sworn peace officer myself — a sheriff’s deputy in California who wore one of those gun belts. So what would I suggest? Cleveland should sue the feds for the right to fire bad cops, after demonstrating that their rules are reasonable and fairly applied — no going overboard in the other direction. The past is the past: as the DOJ report notes, they did a poor job before. The solution is to let them fix that, not force them to keep making bad decisions. Meanwhile, it’s fine to make fun videos, but not to lie about their origin — there’s enough distrust already. We require a high standard of truthfulness from law enforcement, and we should expect them to uphold that standard always. Always. Because if we can’t trust them when it doesn’t count, it creates doubts when it does. Now, scroll back up and hit “Replay” on that video and rock out, now that the truth is clear! Note Added Later: a lot of comments on this, on Facebook and elsewhere, have pointed out the officer often doesn’t have his hands on the wheel. First, do you always keep both hands on the wheel? And second, again, this is staged and not on open roads. His hands not being on the wheel are just another clue about my point! The word we’re talking about here is: integrity. You have it or you don’t. If you have it, you can lose it, and vice versa. Much easier to do the former than the latter. In my ten-year stint as a LEO, integrity was always on my mind. Example: One time I lent some money to a young man who promised repayment the next week. True to his word, the next Saturday while I was running stationary radar, he pulled in front of me, got out of his truck and walked back to me, money in hand. To anyone passing by, this situation could easily have looked like a traffic stop payoff. Unknown guy handing unknown cop cash on the side of the road. If anyone watched the outcome and saw him hand me cash, get in his car, and drive away with no ticket…. I told him to repay me later, at the office, and explained why. You must always have integrity in mind. While this harmless video was fun to watch, the back story is unfortunate, ill-timed, and released without keeping integrity in mind. “Cops admit to faking video” is not a thought you want to encourage. Regarding the Cleveland issue. The arbitrator’s action was based on the fact that the city had, it appears, a policy of turning a blind eye to things much worse. To single out a fairly minor offender, while far more serious offenses are being ignored. Well, I would say he acted in the only way open to him. The proper decision would be termination of those who took part in the more serious offenses INCLUDING those who covered it up and those who were “Blind” to those actions. But that is not an option open to the arbitrator. As for the city, they need to change the policy, write out the new policy including an effective date perhaps 7 days hence, and ENFORCE IT equally for all. Sadly.. I have seen many police “Get away with it” as it were, as have you I’m sure, for one reason or another. I have also seen the resulting arbitration decisions. I don’t know whether police dashcams per se are different, but the dashcams in my squad’s ambulances record both through the windshield at the road, and back into the cab at the crew. During crash investigations, it’s often helpful to see what the crew was doing (paying attention, texting, sleeping) to see if it was contributory. There are so many disturbing parts to the story of the cop in Cleveland. One part with which I have a real issue is how the attorney for the sacked officer could stand in an interview and say with a straight face that this person didn’t deserve to be fired because others had done worse things. Is it any reason lawyers rank almost at the bottom of the list on integrity? Thank you for pointing this out — I felt like the grinch. Love the cop, love the music, love the intention, but it was too contrived. i don’t believe it to be wrong to hold police to a higher standard. As pointed out they are given huge powers that are too often abused. Power corrupts and many with in the organizations turn a blind eye unless caught and even then they get away with it. The irony of the protections corrupt and inept cops receive at the hands of the police union are not lost on me. This analysis is freaking amazing. I saw the video over the weekend, and loved it. I took it at face value, falling “hook, line and sinker” into the lie. At first, after seeing this link on Facebook, I thought “What’s the harm?” I read it, closed it, and went back to my day. It was just a fun video? What’s the big deal! But your words kept eating at me. I found myself saying YEAH! when I thought of the points you brought up. So I came back and read it again, more slowly, and thought about it. And now I say YEAH! — to all of it. Thanks for making me think. Distracted driving. Both hands off the wheel, etc. What kind of an example is this supposed be? Good grief, If anyone was caught driving like this, they would get a ticket. Can’t use a cell phone, but you can drive like this? I can’t find anything on the Dover PD site that talks about this, so I can only judge by the video that was posted. I took this as tongue-in-cheek from the start… I think the department was playing and made it fairly clear in numerous subtle ways: starting in a parking lot, waving to invisible people, even the introductory text felt like play and not like a real “discovery” from review. In my mind what they did was not lying (I believe this is too strong a word for it). OK, many people fell for it, and the PD seems to have clarified readily when that occurred. I think the real observation from all of this is that people are way too gullible, not that the PD did something inherently wrong: they gave their viewers the benefit of the doubt, and the *media* showed their stupidity. The only thing that bothers me about this video is that the officer is demonstrating many things that would be considered distracted driving, reckless endangerment (driving with both hands off the wheel), etc. If *I* were to film this video on the same streets (not a closed environment), I could be cited for many things, but he’s acting as if these are all OK behaviors to have at the wheel. I’m sure he is very skilled, and I would disagree these behaviors are actually dangerous in many cases, but I am opposed to the hypocrisy… either the behaviors are OK for everybody (which they clearly aren’t, in the eyes of the law), or they are not OK for anybody (officers included). Jeff of Anchorage commented about the gullibility of people. This is news? I have, or did have, a recording of the radio broadcast of H. G. Wells’ War of the Worlds presented by Orson Wells. Throughout this program they stop several times to announce that this is not real but only a radio play, yet still thousands, if not hundreds of thousands, firmly believed it to be true and that the Martians were invading. One example was a story of a guy who was asked by a farmer why he had shot holes in the farmer’s water tower. The reason he shot the water tower was that he thought it was a Martian war machine. Given this, even if the Department had posted, quite obviously, that this was a fake, some people would still think it true. Regarding the Cleveland incident (yes, I LIVE there), what you, and especially John from Michigan, are not aware of is the power of the police officers union. The “pattern” referred to in the DOJ report does likely include many cases were punishments and dismissals were overturned on union appeal (but the report did not list or document any past cases). The arbiters, supplied by union friendly NLRB, routinely rule with the union side. Politicians, like the mayor, and the mayor appointed police chief and public safety director, have not had the courage to stand up to this and enforce job standards, as their jobs are (more or less) term-limited until the next mayor wants his guys in there to “clean up the department”. And, quite frankly, for them to take that battle is a losing battle: they would be vilified by a pro-union city and electorate. That’s not even to mention the political heat they would take looking like don’t support police officers. This same problem occurs here with the fire department and EMS. There was a huge scandal with firemen abusing sicktime and overtime, costing the city millions of dollars every year. (Firemen would call in sick, then get called in to fill in on someone’s sick call, and call in sick on that time also, getting sick time and double-pay for overtime. Some firemen had not actually worked on duty for 3 or more years, but still collected $200k-300K in pay, 400-500% over standard pay! City and county officials tried to prosecute, but nothing could be done until FBI and Federal prosecutors finally were able to prosecute the worst of them. The case you refer to is just another example of the clout that government unions have. This is one part of the fight that Gov Scott Walker (succesfully) and Gov John Kasich (unsucccessfully) are waging, and we need more politicians to take up. Do police listen to music in their squad cars? I thought police cars didn’t have a standard radio in them. First clue I had that this was set up. I too have a ‘contrarian’ attitude to this video. We have this police officer, and ‘upholder’ of the law and (supposedly) a ‘good example’ to us driving along in his car while singing along to a song. Nothing wrong with that until he starts taking his eyes of the road. Suppose he is travelling at 30 MPH — in ONE minute he will have traveled 2640 feet – that’s more than enough time and distance to cause a fatal accident. Then, he takes BOTH hands off his steering wheel. So, here we have a cop who is not in control of his car, who is SERIOUSLY distracted by the radio and who is not aware of where he is driving? NOT a ‘good example’ to the rest of us. Basically I think you need to lighten up. Speaking as a retired UK officer, cops do lots worse things than this in the cause of humour. Be grateful for the police you have who are on the whole professional and caring and reflect the society which they serve. Complain too much and you could end up like the one we have where I am now, corrupt, motivated only by bribery money, and having to be cleaned up by a military dictatorship. Support your local cops and they will continue to look after you! It saddens me how much Americans mistrust their police. In the UK instead of a culture of the police being big corrupt arseholes who represent the man we have a culture where the police are treated as equals who you can go to for help. There are a few problems with corruption in London but when it came to light those officers were sent through the courts. My controversial view on this is that our officers are equal because they don’t carry any major weapons. At the most they will carry tear gas or a taser (the latter of which is extremely controversial). If they are in a situation which requires firearms (very rare, three such events in 2013) we have specialist teams who are highly trained for dealing with those cases. The job of a police officer is to make the populace safe, both physically and emotionally. If you are a police officer who is not doing this you are bad at your job. In an ‘Ethics in Government’ class I took many years ago along the way to a Masters Degree in Human Resources, the professor gave a lecture on integrity. He was talking specifically about national politicians at the time, but the same holds true for other public officials: local politicians, police, hospital personnel, etc. And, in my opinion, CEOs of major corporations. His premise was that they spend time, sometimes many years, building integrity so that the public believes in them, their causes, their platforms, etc. The public may not agree with them, but they believe that they will hold true to their beliefs. THEN, in a moment they throw it all away. His prime examples, along with others, were Richard Nixon and Bill Clinton, at that time. But it holds true for police departments and countless CEOs and other high-ranking private company officials like Bernie Madoff, more recently. Our faith and respect for police departments has faltered. The problem at this point is that not all departments are involved, but the problems seen in the few has cast shadows on all. The media is partially responsible for this; they seldom publicize the better things being done by the police departments around the country. They don’t seem to be as newsworthy as the bad things happening. That makes sense in a perverse sort of way. It’s going to take a long time for police departments to bring themselves out of the ‘bad news’ side of the media. I don’t think this video is the way to do it. Just my opinion. Lighten up people! It’s a great video and it made me laugh HARD! Who cares if it’s staged? It was good! Hey some cops are evil, but let’s not throw the baby out with the bath water and turn up our noses at a good joke because a cop made it! 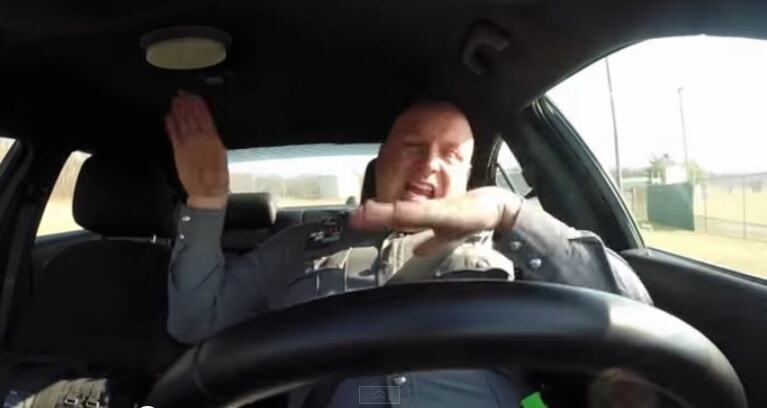 If any other cop made that video it wouldn’t have been nearly as good but that big burly guy doing a lip sync that rivaled RuPaul was priceless! And in this day and age everybody needs a good laugh! A buddy and I were driving home from college one night when someone in a VW pulled alongside, then paced us. After a few seconds my buddy picked up his speed. The clown did the same until he caught up to us, then started pacing us again. This continued a couple of more times. Needless to say, by the time we got to a stop sign we were really ticked off. We come to a stop in the center lane. Fool comes to a stop in the left-hand lane. Buddy floors it, whips around to the left, and rockets down a mile to the main road, then shoots right heading home. Figure that we finally got away from the jerk. A couple of miles down the road I look to my right. There’s goober looking really mad, rolling his window down. I looked at my buddy and said, “Our friend’s back”. When I looked back at the guy, he was holding a pistol. I yelled “Rick! He’s got a gun! !” Rick said later that he didn’t see the gun but he saw that the guy was holding something. It didn’t matter. We whipped around, and roared off down the road in the other direction. About half-a-mile down the road we pulled into an empty lot next to a Dunkin’ Donuts. I jumped out, ran in to the shop yelling to the clerk, “Call the cops! There’s somebody chasing us with a gun!” Then I went back out to try to help my friend. That’s when I found out that our fool was a cop. Several squad cars finally pull up. That’s when they arrested my friend. I pointed at the fool and protested “This man pulled a gun”. “No I didn’t”, was his reply. “I was showing you my badge”. When I demanded to know his name and badge number one of the other cops told me to “Get out of here”. A 19-year-old who had never handled a weapon, I still could tell the difference between a badge and a gun. I also knew that by brandishing a weapon without a valid fear of his life, the cop was in violation of one or more departmental regulations. And obviously he HAD to have been showing us his badge. After all, if he properly identified himself, then we were a pair of mal-lee-fact-tores fleeing the long arm of the law engaged in his proper legal duties. But if he had, in fact and in deed, drawn a pistol without justification, then we did in fact have a justification for running for our lives. As a side note, I’m a 63-year-old white, male, military retiree. Through the years I’ve come to accept that most cops really are good men and women doing their jobs to the best of their abilities. But after nearly 45 years I still don’t fully trust the police. Still, it was fun to watch — and it took a lot of guts on the man’s part to go through with it: Most people would be too embarrassed to let their hair down like that (or in his case, let his scalp down) in public, let alone on film. After the near-war generated by the shooting incident in…..what was it? Ferguson, outside St. Louis, MO?…..the public view of the police needs a little lightening-up. It was meant to help improve public attitude toward the police, not set off another storm of criticism. I think you people in the USA need to relax and get a life. This is funny and good!